While schools will need to install Apple hardware before they will be able to fully take advantage of all the new tools, Apple CEO Tim Cook said the company is working to help with that as well. “What we’re trying to do is facilitate that… we selected 120 schools around the U.S. that are the most needy schools… and we’re working personally with them not just to bring in products, but bring in our people there, as well, to help teachers,” said Cook. Cook took part in an Apple Store Hour of Code program in New York City alongside students from a local elementary school. Each participant used an iPad mini that was running Code.org’s coding course. The new efforts show how Apple is making a push to get ahead of Google, who is becoming increasingly more popular among school districts, with many of them currently using Google Apps for Education, including Gmail, Google docs, and in many cases, adopting the less-expensive Chromebooks. While Chromebooks’ market share has increased to 51% from 40%, Apple products, including iPads, laptops and desktop computers, have declined from 32% to 24%. Meanwhile, Windows-based machines have remained constant at 23%, writes Jon Swartz for USA Today. 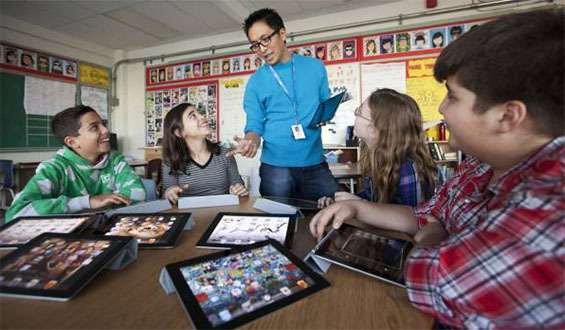 Recent data suggests that although iPads appear to be useful educational tools, teachers seem to like them less, arguing that students find ways to use them to waste classroom time on social media such as Facebook and Instagram.